Sweden's Seventh Wonder scored huge with their sophomore release Mercy Falls in 2008. After several spins of their latest The Great Escape I'm not sure lightning strikes twice. 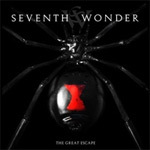 Without question Seventh Wonder is in fine form: musicianship is stellar and the compositions finely progressive. The first half of the album consists six stand alone songs that combine progressive metal with a strong and accessible melodic sensibility. The latter half is the title cut, a 30 minute treatise, based on the epic space saga Aniara, written in 1956 by Swedish Nobel Prize winner Harry Martinson. As to the former, the six are all fine songs, but some are better than others. Specifically, Wiseman, The Angelmaker, and King of Whitewater excel over the lyrically strange and musically adrift Alley Cat. Seventh Wonder seems to experiment with the deftly melancholy ballad Long Way Home which has a near commercial melodic rock feel. To the title track, those remembering the breadth and depth of the arrangements of Mercy Falls should devour this complex piece. A single piece at 30 minutes could be oppressive and monotonous, but Seventh Wonder offers sufficient segues and varied movements to keep your interest. And that is probably the single requirement necessary to enjoy The Great Escape: your undivided and exceptional interest. You cannot listen to this work and also preoccupy yourself with a book, crossword puzzle, or even surfing the Net. The Great Escape will becoming only background noise, and hardly compelling at that. This is certainly the case with the title track The Great Escape. Again, while all the songs are entertaining (with possible exception of Alley Cat), only moments are truly gripping. Nevertheless, this does not make The Great Escape a step backwards, but rather an engrossing challenge. Recommended. Seventh Wonder's third The Great Escape is part departure from from the previous work and part a visitation to their beginning. It's a challenging listen requiring near undivided attention for enjoyment.